The goal of the present review is to describe the current findings on the association of sleep with resistant hypertension (hypertension that remains uncontrolled despite the use of three or more antihypertensive medications from different classes, including a diuretic). Sleep disturbances, particularly obstructive sleep apnea (OSA), are highly prevalent among adults who have resistant hypertension. Randomized controlled trials indicate that treating OSA has modest effects on blood pressure lowering among those with the highest initial blood pressure. There is a paucity of research on the association of habitual sleep and other sleep disturbances with resistant hypertension. 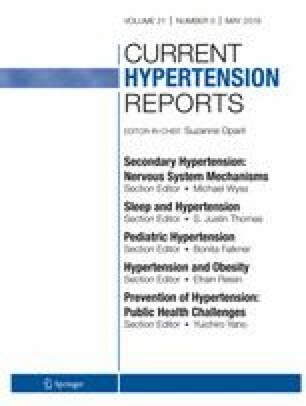 Of note, the most recent observational studies describing the association of OSA with resistant hypertension are comprised primarily of non-white race/ethnic groups who are far more likely to have resistant hypertension. OSA is associated with resistant hypertension, but there is limited data on associations between sleep characteristics and resistant hypertension. Future studies should investigate whether treating OSA can reduce disparities in resistant hypertension and whether other aspects of sleep also contribute to resistant hypertension. National Center for Health Statistics. Summary health statistics tables for US adults: National Health Interview Survey 2014. 2016. (http://ftp.cdc.gov/pub/Health_Statistics/NCHS/NHIS/SHS/2014_SHS_Table_A-1.pdf). (Accessed September 28 2016).